Takifugu obscurus is popular in Asian markets because of its delicious taste and high nutrition. The fish heads and bones which account for a significant proportion of whole fish, are rich in protein. The objective of this study was to investigate umami and bitterness profile of protein hydrolysates from cultured Takifugu obscurus by-products. In order to obtain hydrolysates with higher the degree of hydrolysis (DH) and better sensory characteristic, its hydrolysis condition was optimized using a response surface methodology (RSM). The model equations for the effects of temperature, pH and enzyme/substrate ratio (w/w, %, smashed head and bone as substrate) on DH, umami and bitterness were proposed. Protamex as the suitable enzyme was used to improve the taste profile of hydrolyzed product. 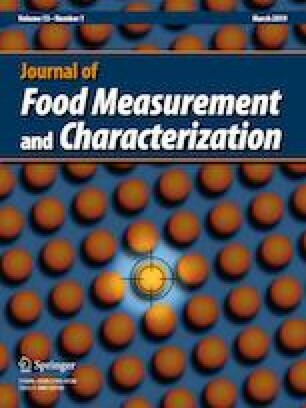 The optimized model was significant and produced an experimental value (DH 48.62 ± 0.67, umami 5.25 ± 0.42 and bitterness 2.34 ± 0.39) in good agreement with the predicted value (49.21%, 5.50 and 2.04). The hydrolysate exhibited higher free amino acids (1733.19 mg/100 g) than the untreated sample (267.49 mg/100 g). The results indicate that protein hydrolysates from Takifugu obscurus by-products may potentially serve as a good source of desirable peptide and amino acids and can be used as the precursor of seafood flavoring agent. The online version of this article ( https://doi.org/10.1007/s11694-019-00118-3) contains supplementary material, which is available to authorized users. This work was supported by The National Key R&D Program of China (2016YFD0400803) and National Natural Science Foundation of China (Grant No. 31622042). The authors declared no competing financial interest.